Well, if you’re blessed with perfect skin – no under-eye circles, no blemishes, no red patches – then you don’t need to bother at all. The rest of us mortals, however, sometimes need a little bit of help to even out our skintone before we apply foundation, so that we don’t need six layers of foundation to look one colour! I’ve actually only recently started using concealer since I moved away from mousse foundation – that was heavy enough to cover any dark circles I had (although it also made me look weirdly velvety and orange – more on that next week though). When I switched to using my medium coverage liquid foundation, I found I needed something a little bit more heavy-duty to deal with my under-eye circles (and the occasional spot, although I don’t often get them). That’s where concealer comes in! First, you’ll need to select a concealer that looks good with your skintone and your foundation – I am very pale, so I use the lightest shade usually. You also need one you like the texture of, that’s not too heavy or cakey. 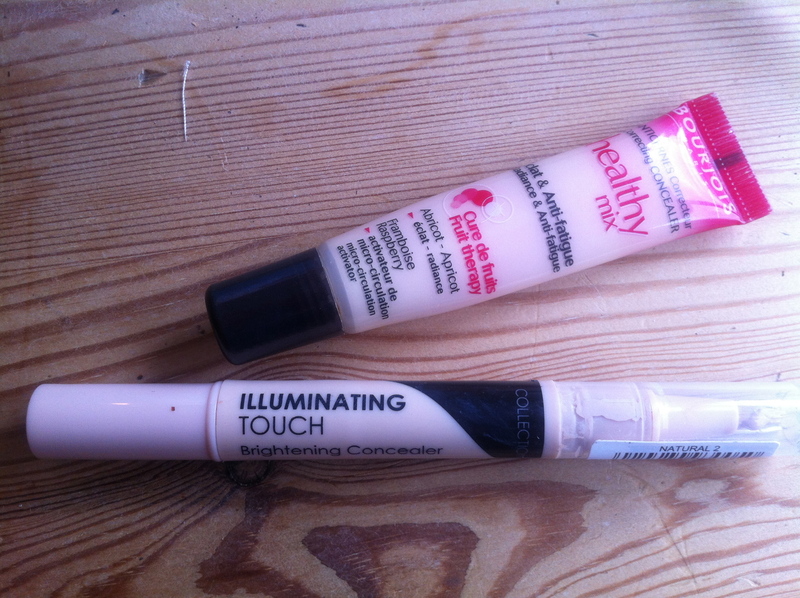 I love Bourjois Healthy Mix Concealer (I use shade 51, on the right above), and will use my mum’s Collection Illuminating Touch Brightening Concealer in a pinch (she uses shade 2, but 1 would be better for me. 2 is ont he left above). 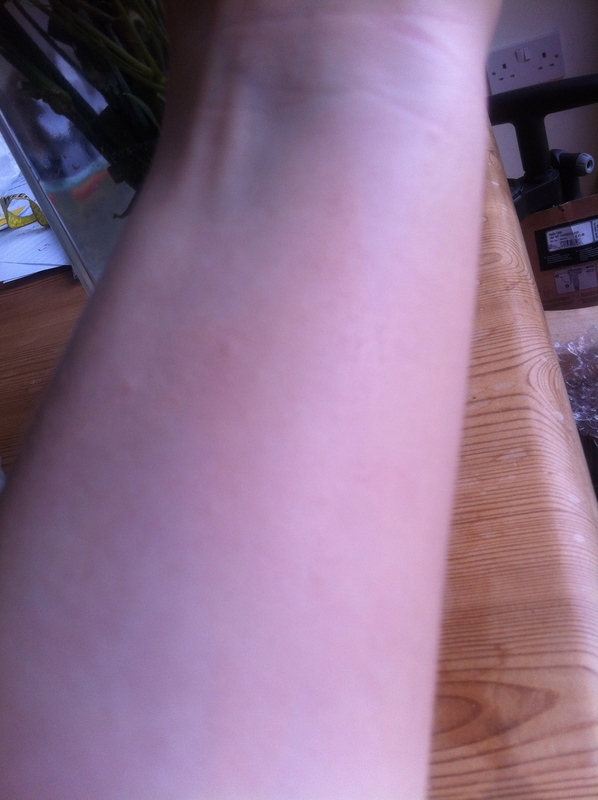 They might not look quite right on your hand/arm if you swatch them neat, so try to blend them out. 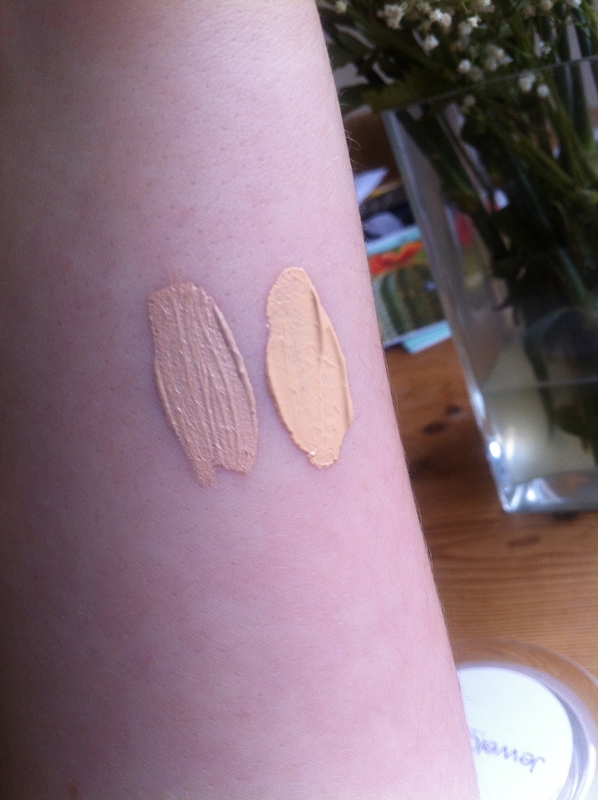 Both colours in the picture above look awful when unblended, but blended, just look, much better (if a blurry phot)! Take a very small amount of concealer either on a brush or on your finger, and pat it gently into the area you want to cover until the colour is more even. I usually put concealer under my eyes (to deal with dark circles), under my eyebrows (to cover a couple of bright veins), across the bridge of my nose and round my nostrils (for redness) and of course, on any spots. You may not need it in these places – only you know your face! Remember, you can add more but not take it away, so go slow. You don’t want tide marks around your eyes, or worse around a spot! For me it was trial and error to cover my eye circles enough but not too much, so have a practice. You’ll soon work out what coverage you need. I’m fairly new to concealer myself, so remember this is only what works for me! I’m really interested to see other people’s favourite brands and uses for concealer, so if you’re part of the SO Project, leave me your links! Are you a concealer fan? What advice do you have? This entry was posted in Beauty and tagged advice, beauty, beauty advice, beauty products, bourjois, concealer, make up, the so project, the starting off project, thesoproject. Bookmark the permalink. ← Oxford Fashion Week Dress Up LiveFriday at the Ashmolean! Haha! I know, but my mum wanted one that had a brush like Touche Eclat, so she went for this one – it’s pretty good though! Those blend in so well, I really want to try the healthy mix, I want to try the foundation too. Thanks for stopping by! Definitely go and test the Healthy Mix things, they’re such a gorgeous texture you’ll fal lin love! I’ve heard so many great things about the healthy mix concealer but I wasn’t a massive fan of the foundation. I love reading everyones posts for the SO project! Can’t wait til next weeks. Well, the foundation is my Holy Grail, so to be honest I only picked up the concealer because I like to have matching products (day and night cream, shampoo and conditioner, foundation and concealer)… 😛 But I do really like it as a concealer, it must be said! The SO Project is a bit exciting, isn’t it 🙂 I’m loving finding so many new blogs to follow!